I love themed activities. It just seems to add some fun to out learning activities, especially Maths activities that the kids need to practice. Last week I spotted that the new Mrs Mactivity site had some Easter Egg Number Bonds, but they were for number bonds to 10, they looked so cute but we have covered those. And then when I was on their site looking for some spring themed colouring items (see at the end of the post) I spotted that they had also created some FREE to download Eggs for Number Bonds to 20, so I quickly downloaded those, printed them on card and we started cutting the eggs out. Although the Number Bond activity was for my youngest the kids thought the eggs looked better coloured in so both of them got to work (there are quite a few eggs to colour in so it helped that big sister joined in – plus she had just gotten some new sharpies and whenever new stationary arrives it needs to be used immediately). 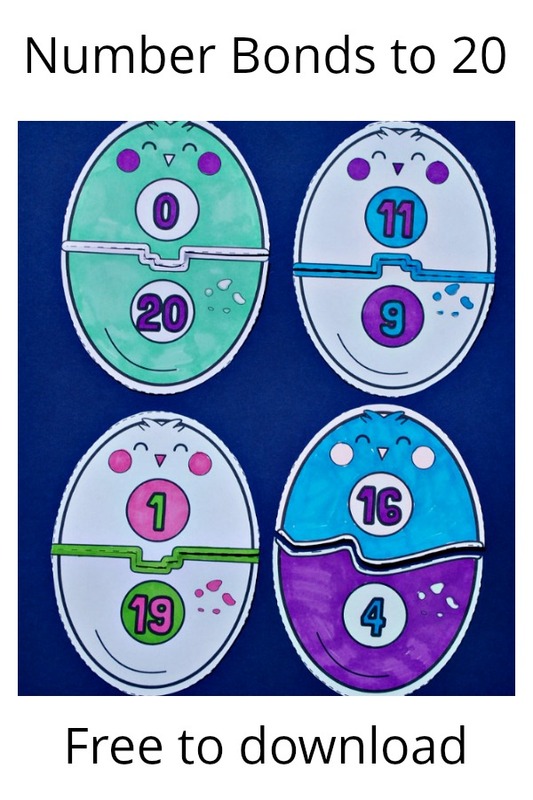 The idea is that the kids needs match the two halves of the eggs together to make up 20. Straight forward activity but a fun way to practice some number bonds (until I started our home ed journey I never realized how knowing number bonds was such a good basic stepping stone for kids maths – so now we practice and practice them but we try to keep it fun and vary the activities). It was actually a great activity because he kept pointing out how sums like 13+7 where similar to 17+3 that you just “flipped the numbers around” – his words. After he had matched all the eggs he went around and pointed out all the different number patterns that he could find. And because we have been practicing spelling some number words I suggested he write out labels and see how many eggs he could label (with the correct words). 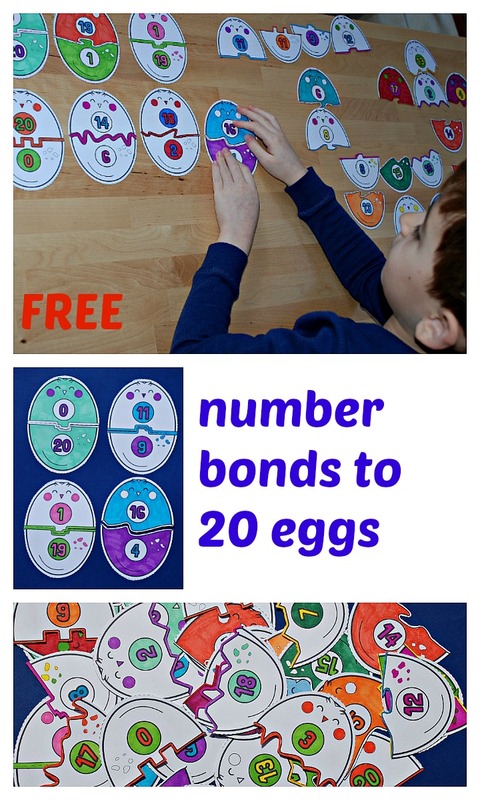 I am really happy with how this Number Bond egg matching activity turned out – the kids did excellent colouring, my son practiced his number bonds, noticed some patterns in the sums and practiced spelling his number words. 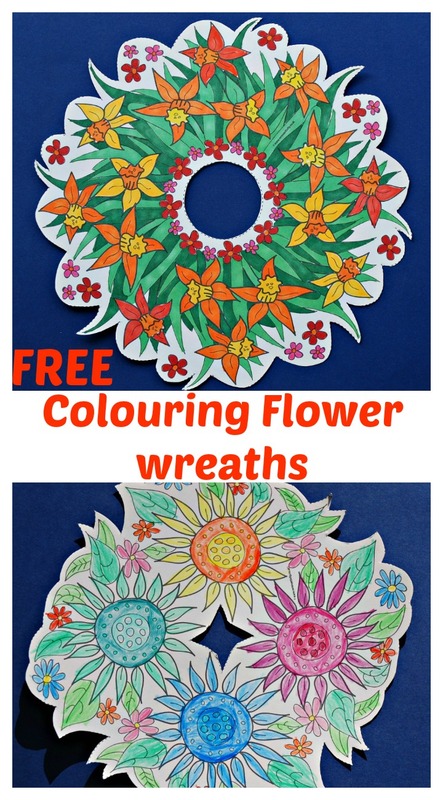 And if you are looking for a fun Spring themed colouring activity – these FREE to download Flower wreaths are very popular with my daughter. They have three different designs on the website. My daughter even managed to get her brother to do one – although he did comment that he does not understand why no-one makes colouring wreaths with animals on them (he thinks everything should come with some sort of animal included). The Mrs Mactivity website is a fairly new website that has educational and craft pages and activities to download. This entry was posted in Homeschooling and tagged Easter, free printables, home ed, home education, homeschooling, Mrs Mactivity, number bonds, spring. Bookmark the permalink. Lovely work Mom and children. I love the way you’ve taken this activity and made it your own! Great idea to extend it by using the written word – brilliant!